You are about to have a "why didn't I think of that" moment. Today's post is going to completely change your space saving game. From this day forward you are going to love taking out the trash. Okay, so I'm over exaggerating, but seriously this super easy DIY TRASH BAG ROLLER has definitely made changing our trash bags a whole lot funner! And funner is essential when we're talking about throwing out the trash, you know. I saw this on Pinterest last year and finally got around to installing the trash bag roller in my laundry room this March. And yes, that means it took me 6 months for it to make it on my blog. What can I say? "Totally-has-it-together blogger" in the house. Ready to see how easy it is to make and what you need to make it? Alright....let's roll (pun totally intended). Seriously, I could just end this post with that picture since it pretty much says it all. But for the sake of keeping up with the "totally has it together blogger" name that I've made for myself, let me go ahead and explain what I did. All you need is a wooden dowel (I got a long one from Hobby Lobby and just cut it to size), 2 corner braces, 2 conduit clamps and some screws and washers. The sizes of each item will depend on the size of your trash bags. I don't remember which size corner brace or conduit clamp I used, but they're pretty small. I have small trash bags so I needed a thin dowel to jam into the opening of the roll. I recommend inspecting your trash bag roll first to see what size dowel would fit in it. Installing it on a wall is so easy, too! I'm proud to say I did this all by myself! I would of normally let the hubby handle this one but he was busy and I didn't want to wait. I had already waited a whole year since I saw the pin after all, who knows what an extra day or two would have done to my patience. 1. Measure the width of your dowel and make a marking on your wall where each side will go. Take into consideration that you will want at least 2 inches of your dowel to hang off of your clamps. 2. Screw in your corner braces first along the marks. 3. Screw your conduit clamps into your corner braces. 4. 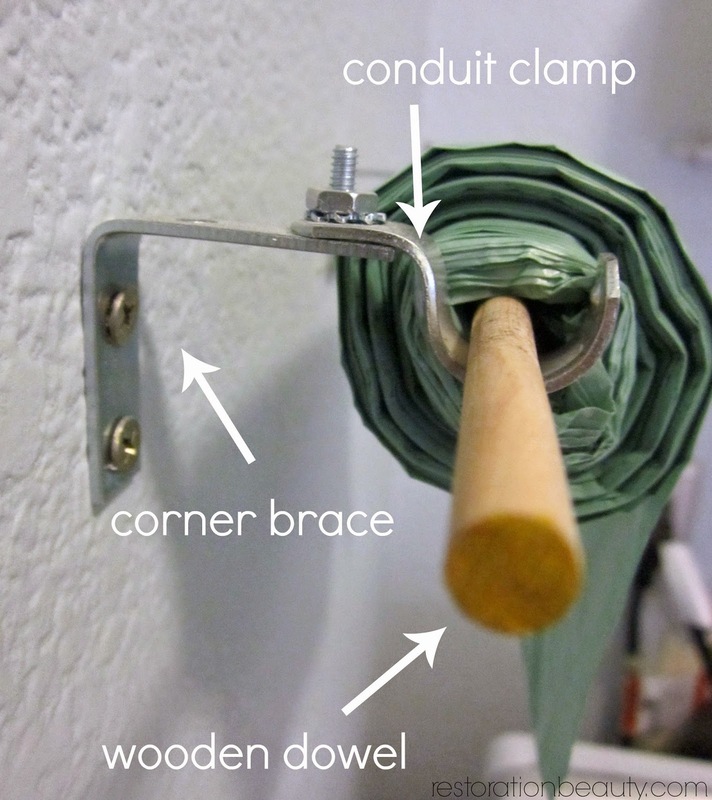 Slide your dowel into your trash bag hole and set the dowel on the clamps. 5. You are done. Do a little dance and have fun trying to fill up your trash can faster just so you can grab a bag. And don't worry about the dowel falling off the clamps, I've never had that problem. So long you're not angry when you're pulling a trash bag down and pull too hard, you should be fine. If you are angry just have someone else take out the trash, preferably the person you're angry with. There's a solution to everything, my friends. P.S.- My daughter is turning 4 on Monday and I'm totally thinking, "why have I been feeding her 3 meals a day? She's growing too darn fast!" I could have sworn we brought her home from the hospital just the other day! Thanks for stopping by! You can follow Restoration Beauty on Bloglovin, Facebook, Pinterest, Instagram and Twitter and always be updated on all the fabulous that goes on around here! Girl, you've got it going on with installing that all by yourself! Good job! I love your commentary too. :) This is going to sound weird, but I love that your bags are green...they're so much prettier than my white ones. Ha! P.S. I also meant to say that yep, they grow fast, don't they? I just had one turn 20 on me!!! I totally remember when they were 4 though. So cute and they didn't spend all their time on their phones back then. :) Enjoy that sweet girl and tell her "Aunt Lisa" says Happy Birthday!!! 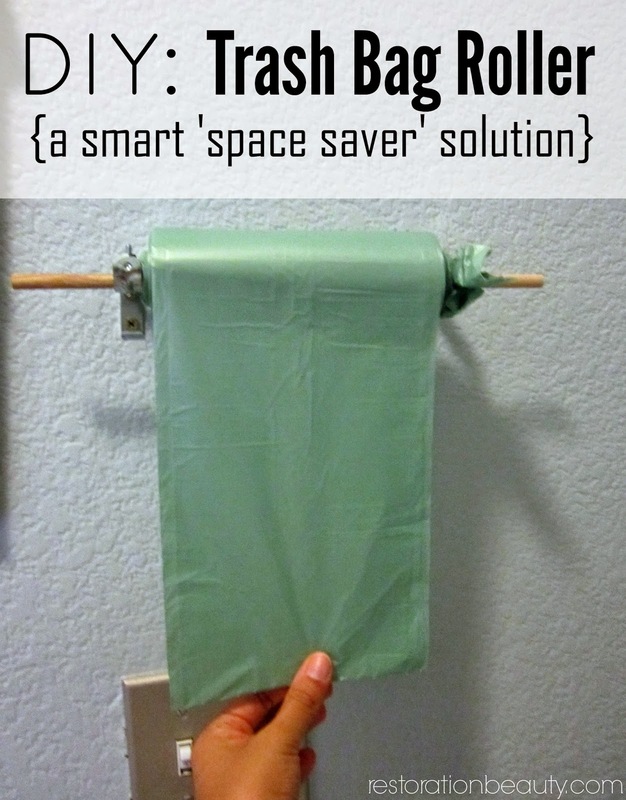 Influenced by a toilet paper roller, this trash bag roller is definitely a convenient way to roll out the trash bag so it can be easily changed. Wonderful thought and nice space saver. Do you have some kind of a stopper to disable the trash bag from rolling out completely? I store my extra bags in the bottoms of the receptacles that use them. That way, they are out of sight and always available to replace after removing a full one. thanks for the birthday wishes for my little one too ..
Beautiful blog by the editor. Birthday is the most Special Day in our Life. happy birthday to you. best wishes, cards and greetings to my girl. happy birthday baby. do you want to be a part of playxn!? The best and glorious collection of Happy Diwali 2016 Greetings wishes, cards, images, quotes to make your Diwali remarkable this year. Happy Diwali 2016 Greetings that can be sent through SMS to your near and dear ones. Diwali is a festival of lightning which was introduced when Lord Rama came back to Ayodhya after their 14 years of Vanvas after defeating the cruel and egoistic Raavan. Veterans Day 2016 celebrated on 11 Nov on Friday. It is celebrated mostly by US citizens in the memory of their soldiers. Thanksgiving festival is just only a few days away, it could be fun to want the persons above you Happy Blessed Thanksgiving funny thanksgiving wallpaper pictures of thanksgiving day funny christmas message new year celebration pictures or you can tell anyone here Happy and lovely Thanksgiving. Our request to all my friends and everyone here is that all of you have a wonderful and blessed Thanksgiving. content too. Now a days everyone looks for deal of the day products in online shopping .